IBM® Watson™ Content Analytics (Content Analytics) Version 3.0 (formerly known as IBM Content Analytics with Enterprise Search (ICAwES)) helps you to unlock the value of unstructured content to gain new actionable business insight and provides the enterprise search capability all in one product. Content Analytics comes with a set of tools and a robust user interface to empower you to better identify new revenue opportunities, improve customer satisfaction, detect problems early, and improve products, services, and offerings. 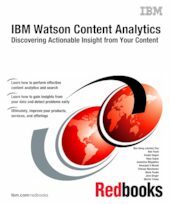 To help you gain the most benefits from your unstructured content, this IBM Redbooks® publication provides in-depth information about the features and capabilities of Content Analytics, how the content analytics works, and how to perform effective and efficient content analytics on your content to discover actionable business insights. This book covers key concepts in content analytics, such as facets, frequency, deviation, correlation, trend, and sentimental analysis. It describes the content analytics miner, and guides you on performing content analytics using views, dictionary lookup, and customization. The book also covers using IBM Content Analytics Studio for domain-specific content analytics, integrating with IBM Content Classification to get categories and new metadata, and interfacing with IBM Cognos® Business Intelligence (BI) to add values in BI reporting and analysis, and customizing the content analytics miner with APIs. In addition, the book describes how to use the enterprise search capability for the discovery and retrieval of documents using various query and visual navigation techniques, and customization of crawling, parsing, indexing, and runtime search to improve search results. The target audience of this book is decision makers, business users, and IT architects and specialists who want to understand and analyze their enterprise content to improve and enhance their business operations. It is also intended as a technical how-to guide for use with the online IBM Knowledge Center for configuring and performing content analytics and enterprise search with Content Analytics.